If everyone is eventually going to serve up some fresh hot takes about “Who won E3 2018?” then I’d like to at least offer up a humble suggestion for a factor to consider: Who used music the best? So far this year, with the press conference events that have currently passed, three companies appear able to compete according to that measure. First is Bethesda, who commemorated the upcoming Rage 2 by having the party savant himself, Andrew W.K., do a nice and spirited live performance of its trailer theme song, “Ready To Die”, to an audience not nearly so deserving. Next would appear to be Sony’s press conference—I was getting positive life choices going at the gym during the event, so it was up to Kirk (bless his musician soul) to be the tipster—with not one, but two live solo instrumentals preceding trailers. At the very beginning was a banjo performance by The Last of Us composer Gustavo Santaolalla. Half an hour in was a shakuhachi performance that preceded the gameplay trailer for Ghost of Tsushima. The vibe-setting and immersion for both times was admirable, and from what little I can tell, it seems they succeeded! For my money, however, the people I’ve got to give it up for the most on the music front is Ubisoft. They were wholly dedicated to making a couple of their press conference moments into musical occasions, to an extent that no other conference had maintained, and pulled them off with aplomb. It all started at the very beginning of their show, with...a marching band medley. Now, I was listening to the first part of the Ubisoft press conference while driving home from work, so I was utterly confused at why the hell we were all listening to a brass section pump out “Havana” and “Sugar”. Guess they’re just gonna be real extra today, huh? Quite frankly, though, it was so delightfully absurd, I couldn’t help but be on board with it all! 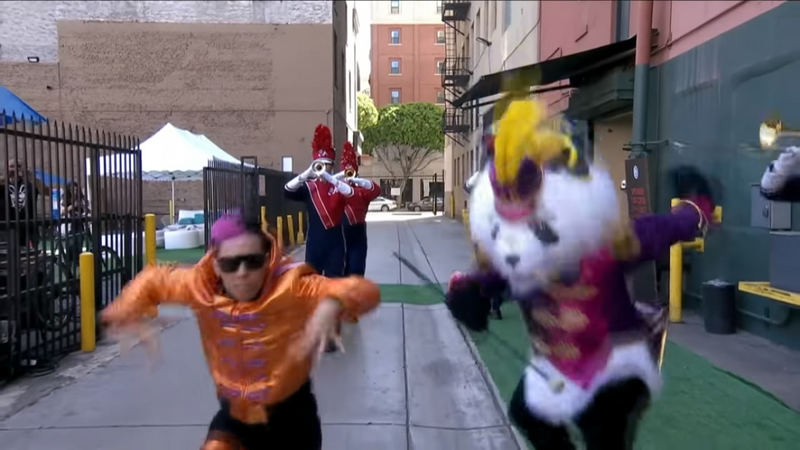 I then eventually realized, when later seeing that halfway through the performance they finally entered the auditorium, that this whole thing was an ultra-elaborate mega-vainglorious celebration for the latest iteration of Just Dance. It finally all made sense. And with that, I could say for certain that this was, no lie, such a genius way to make that announcement. Outside of playing it once at some college event I wandered upon and having fun with it, this series has never been on my radar (#DanceCentral4Life); I imagine that it probably isn’t for lots of the “core gamer” contingent, either, especially for the kind of audience that an E3 presser would attract. Maybe Ubisoft took that into consideration and was just like SCREW IT, if they’re not going to care so much anyway, let’s lean into that and just have all the fun we can!! Why not turn this into an outrageous spectacle?!! And it worked. Plus, if all of those songs in the medley are going to be part of the Just Dance 2019 soundtrack, then that means everyone will have the option to shimmy to Elton Frickin’ John, and that is a life-affirming sentence. Later on in the show, for a segment about the Donkey Kong DLC for Mario + Rabbids Kingdom Battle, another musical surprise was in line, courtesy of composer Grant Kirkhope along with Critical Hit. This just made my heart burst. For one, Kirkhope’s work on Mario + Rabbids is incredible, so showing off the Donkey Kong gameplay trailer and accompanying it with a live rendition of his music was delectable on its own. The bigger part of it, however—what made this thing unusually emotional—was how this moment represented a homecoming of sorts. Grant Kirkhope is arguably most known as one of Rare’s composers from back in the day. One of Rare’s most famous exports, in turn, was their plethora of Donkey Kong games. Grant, in fact, was even the composer of Donkey Kong 64! And DON’T THINK FOR A SECOND, on that note, that I didn’t catch their brief DK Rap drop! Ubisoft picking up one of Rare’s stalwart musicians to help out with their Mario game was already an excellent deal on its own. The Donkey Kong DLC, however, evolves their choice of Kirkhope as composer into something poignant, reuniting him with a character he’s had some history with, both through his own personal Nintendo 64 work and through the wider legacy of his old studio. Ultimately, this press conference played with its music to a degree that none of the other events (thus far) dared to match. Despite their storied issues as a publisher and developer, it is good to see that Ubisoft can still knock some things out of the park on occasion. Bravo.